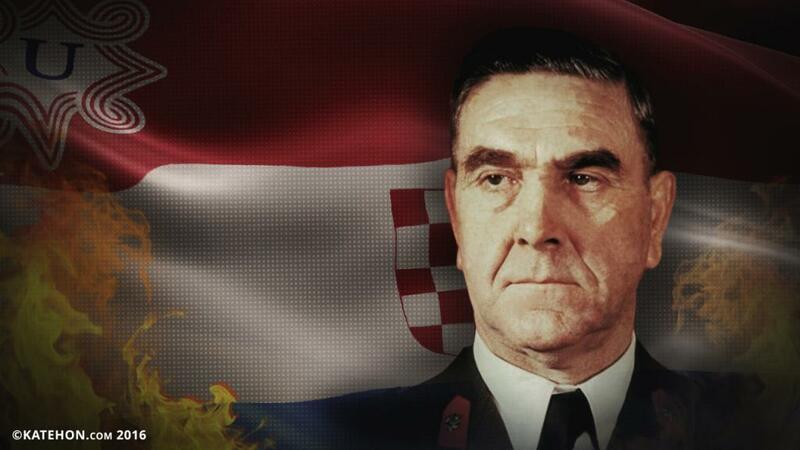 Croats celebrate August 5th as their national victory day. Serbs remember this day as the somber day on which ethnic cleansing and genocide was conducted against them by the Croats. On this day, in the wake of the Croatian military action “Oluja” (“Storm”), more than 250,000 Serbian civilians were forced to relocate from their homes in Croatia and move to Serbia. This text will focus on the overarching context, on the historical and psychological framework relevant to understanding how such genocide can be a victory and symbol of national identity. There are few nations which can so certainly be claimed to have originated such ruthless manipulation and falsification of historical facts as the Croats. Besides its specifically kleptomaniac impulse to falsify historical facts, the Croatian nation as we know it today bases its history on two other pillars. The first is hatred towards Orthodoxy directly encouraged by the Vatican, and the second is hatred directed against Serbs. Croatian Serbophobia can be regarded as an authentic Croatian heritage that is a source of their pride and which can be defined as one of the most essential characteristics of their national identity. Unfortunately, over the last hundred years, this took an even more extremely confirmed and explicit form than before. Croatian Serbophobia dates back as a centuries-old modus operandi concocted by a small vassal nation of relatively small importance to the history of South-East Europe. This modus operandi, moreover, was to a certain extent backed by this nation’s own invaders, such as the Hungarians, and often by the Roman Catholic Church. Some of the most vivid examples of this impulse include the perpetual violence carried out against Serbs during the last millennium ranging from the choice between execution or conversion to Catholicism posed to Orthodox Serbs in Bosnia in the XI century under the instructions of Pope Sixtus II and helped by the Hungarian King Koloman, all the way to the the ethnic cleansing and genocide against the Serbian people in Republika Srpska Krajina in 1995. This hostile and aggressive position of Croats directed against Serbs which emerged thousand years ago has varied over time only in its intensity and frequency. It has remained a qualitatively constant and unchanging feature. Moreover, it stands completely contrary to any of the solidarity and “brotherhood and unity” that was imposed upon us during one period as an artificial ideological tool contrary to historical logic and organic evolution. From the 9th century until the end of WWI, the Croatian state did not have any semblance of political independence. In addition, it is extremely difficult to obtain any serious or unconditional historical trace of the existence of “Croats” in any relevant historical archives, whether the ones from Constantinople, Venice, Milan, or Vienna. In his History, the famous historian from Dubrovnik Marvo Orbini mentions only one nation known during the medieval period in this part of the world: the Serbs, as he describes their dynastic Nemanjić family and other Serbian medieval rulers and dynasties, such as the Hrebeljanović , Mrnjavcević, Vojnović, Altomanović, Kosača and Balsić. In opposition to relevant and serious historical science, false claims can be found in many Croatian sources that the Croats are the “old nation of warriors and generals.” But real history mentions none of them. One example of their often absurd approach to history in which we can locate political motivation is the popular claim that the Croats had 302 rulers from the Ban Borna period in 819 to the fall of the Habsburg monarchy in the 19th century. This would be outrageous even for a more respectable history, such as that of the Russians, but it is even more so for a peripheral history as the “Croatian” one. Another important Croatian manipulation and falsification worth mentioning is their adoption of štokavica, a Serbian dialect, and its introduction as the Croatian literary language in the 19th century, which means that the Croatian nation speaks pure Serbian language, even though they mean to invent new linguistic terms and define such as authentic Croatian. In the last two decades, this has become such an intensely absurd effort that they have striven to deviate from the original Serbian language as much as possible on the basis of purely political motivation. The idea of ​​“Yugoslavism" was shaped in the 19th century by an important Catholic cleric and Croatianized German, Juraj Štrosmajer. This idea, which was supposed to unite all South Slavs and put them under the rule of the Austro-Hungarian monarchy, had as its real aim converting the Orthodox, i.e. Serbs, to Catholicism in a more perfidious and "elegant" form. This idea of unifying the South Slavs was devastating to Serbian national interests from its very beginning all the way to its developed form in Socialist Yugoslavia, led throughout most of its existence by Josip Broz Tito, another Croat. During this developed form of Yugoslavism, many new artificial nations were created within the Serbian national body out of destructive intentions, including the Bosnian Muslims, the Macedonians, etc. Due to a lack of historical experience of living in the same state, Serbs did not understand just how erosive and destructive the Croatian national element could be - such as during the Great War, when Croats were part of Austria and at war with Serbia, or shortly before in the Balkan Wars when the Croats strongly supported the Bulgarians, or even earlier in the past when, after the Serbian-Turkish War of 1876-1878, they expressed their respect for the Turkish victory at the Battle of Djunis by sending a golden sword from Zagreb to Turkish Pasha. There’s also the unfortunate year of 1918 when the Kingdom of Serbs, Croats, and Slovenes was created, an entity that would be just as erosive for Serbian national interests. By 1941, Serbs should have known out of experience that the most monstrous and massive genocide in modern European history was nearing. But they did not. They were once again unprepared. Serbs did not expect what was going to happen - a genocide against the Serbs of the Nezavisna Država Hrvatska (Independent State of Croatia – the most important political ally of Hitler’s Germany in the Balkans) and the most cruel violence of one nation against another with the support of the Roman Catholic church. Only few years before this genocide, Croats were a part of the Kingdom of Yugoslavia ruled by the Serbian Karadjordjevic dynasty, the victors against Austria in WWI. Even then, there was significant Croatian hostility towards the monarchy and its centralized structure which the Serbian Royal family historically inherited from the medieval period of the rule of the House of Nemanjić having emerged out of the traditions of the Orthodox Church. In fact, their complaint was that the country was too "velikosrpska" (“great-Serbian” in the chauvinistic sense). On the basis of this perception, Croat “decentralists, autonomists and federalists,” in 1939, created Banovina Croatia as an independent and autonomous “state within a state.” This served as a political framework for Serbophobes who developed the idea of finally dismissing relations between Serbs and Croats. Banovina Croatia’s founding was the point at which the logistic, legislative, and military infrastructure was laid for the Nezavisna Država Hrvatska of Ante Pavelić that would appear only two years later. Nezavisna Država Hrvatska (Independent State of Croatia) was a fascist, chauvinist, clerical and Serbophobic country and an ally of the Axis powers in the Balkans built on the fundamental predispositions already defined during the 19th century. This state arose on the ideological grounds of the Croatian politician Ante Starčević, the father of the nation and of all advocates of "Greater Croatia". The extreme terror carried out by Ante Pavelić's Ustaša (the Ustaša movement was an illegal movement in the Kingdom of Yugoslavia and represented the core of Nezavisna Država Hrvatska, as well as its military part) regime against Serbs, Jews, and Roma was part of a chauvinistic, extremely Serbophobic ideological platform developed by his party colleague and successor, Joseph Frank. Frank's idea that the Serbs in Bosnia should be expelled or massacred was the work that Ante Pavelic carried out in the NDH with the support of the Roman Catholic Church. Concentration camps for Serbs existed even before 1941 in Banovina Croatia for political torture against those who stood for a more centralized Kingdom of Yugoslavia. After the German occupation and emergence of its satellite, the NDH, these camps were renovated, expanded, and legislatively defined as a work camps for Serbs, Jews, Roma and anti-fascist Croats. The camps on the territory of NDH were the bloodiest genocide factories in this part of the world with two of the most extreme black dots: the Jasenovac concentration camp on the one hand, and the concentration and extermination camps for children (which made the atrocities of the Croatian NDH and Ustaša stand out even among the Axis powers) on the other. Guided by Pavelic's instruction (“He who cannot tear a child out of the womb of a mother and stab him with a bayonet is not a good Ustaša”), the Ustaša regime committed monstrous violence against not only the civilian population as a whole, but specifically and directly against women and children. A few monstrous example include leaving the skulls of children in mothers’ laps, butchering and stomping children in front of their mothers, and smashing their skulls with hammers before mothers’ eyes. In order to further understand and elucidate this phenomenon, it is important to recognize that, throughout the entire Second World War, Croatia was the only place where camps specializing in the extermination of children operated. Over the course of the 5 years that the Jasenovac camp was in operation, around 75,000 children, mostly Serbian (but also Jews and Roma) were killed. Victims’ eyes and ears were worn around the neck of their slaughterers, the skin of prisoners was used for lampshades, children were thrown alive in bags into the Sava River, and daughters were raped and butchered in front of their parents. People were skinned alive and then rubbed with salt, competitions were organized around the speed of slaughtering prisoners, and soap was made out of human skin. These are not presumptions, but proven and documented historical facts. Horrific facts at that. In short, centuries of pathological hatred towards Serbs has formed the backbone of Croatian national identity. Although the precise number of victims at Jasenovac has not been determined, the most serious calculation amounts to 700,000 victims, with its critical point in the methodology that was used to kill men, women and children, and the born and unborn. Jasenovac was hell in full volume in all of its characteristics. The Vatican and Roman Catholic Church’s participation in supporting the NDH Ustaša regime, moreover, was explicit. The Vatican’s approval and favor when it comes to the NDH and Ustaša can be seen in the post-war destiny of the state and movement’s spiritual father, Bishop Alojzije Stepinac, who supported genocide against non-Croats, especially Serbs. Stepinac was sentenced to the moderate punishment of house arrest by the Yugoslav authorities and was promoted to cardinal by Pope Pius XII. Pope John Paul II declared him a martyr. Under the government of Franjo Tudjman, the first president of the independent Croatian state after socialist Yugoslavia, church processions were carried out on each anniversary of the death of Stepinac in his honor attended by high state officials as guests. Today, under the rule of Kolinda Grabar Kitarovic, Stepinac has been completely legally rehabilitated. Ante Pavelić based his strategy on the idea that a third of all Serbs should be killed, one third converted to Catholicism, and a third expelled from Croatia. This is what happened half a century later during the largest ethnic cleansing since World War II. The Croatian military’s Operation Oluja ("Storm") began on August 4th in 1995 and formally lasted three days. Over 250,000 Serbs (some estimates suggest more than 300 000) were expelled from their ancestral homes and thousands of them were killed and massacred when the Croatian Army entered Knin, the capital of Republika Srpska Krajina (Serbian Republic Krajina – Serbian ethnic territory and state during the civil war in ex-Yugoslavia). During the mass withdrawal of a column of civilians from Croatia to Republika Srpska (the Serbian state in Bosnia) and to Serbia, civilians were attacked by Croatian land and air forces. It is important to understand that the Serbs had not originally come to Republika Srpska Krajina as invaders or settlers, but had inhabited the lands there for many centuries. This land became Republika Srpska Krajina, or Vojna Krajina as it was called before it was populated by the Serbs back in the Middle Ages when this territory was the border area between the Habsburg monarchy and the Ottoman Empire. Between the 13th and 14th centuries, the continuous migration of Serbs to the Krajina and Slavonia, the border parts of the Habsburg monarchy, forged this land’s makeup as Serbs migrated from the Ottoman Empire to the neighboring Christian state in order to keep their Christian faith. As a national element which knew the Turks well and had historically confirmed and developed military traditions, the Serbs of Krajina were used by the Austrians as border guards and as an important element of the Habsburg military. Even further in the past, the presence of Serbs in this region dates back to the 9th century when they were mentioned in the works of the Frankish chronicler Einhart. Thus, Serbs populated the area, today part of Croatia, even before the Croats arrived and before the emergence of any Croatian state. The First Vojna Krajina (Military Frontier) populated by Serbs was officially formed in 1579 with a certain element of independence. Following the Habsburg occupation of Bosnia and Herzegovina and subsequent administrative reorganizations, this state ceased to exist in 1881, but the Serbs who inhabited the area continued to live there as free farmers. According to the census of 1921, 658,769 Serbs inhabited the area. During the reign of the fascist NDH, around half of them were killed, and the migration of those who survived to Serbia was also massive. In the Socialist Federal Republic Yugoslavia, Serbs’ positions in Croatia were difficult in a social and existential sense. The communist regime of Josip Broz Tito was tolerant of all forms of oppression against Serbs living in Croatia. Civil, religious, and inter-ethnic wars in Yugoslavia then erupted in precisely this part of Croatia when Croatia refused to recognize the Serbs as a constituent people of the Republic of Croatia. When Croatia declared its independence, Serbs wanted to remain in the same state as Republic of Serbia, and thus declared their independence from Croatia. Five years later, the world witnessed the mass expulsion of Serbs from the Republika Srpska Krajina with strong and concrete military and logistics support from the USA, with the blessing of the Vatican, and under the flags and symbols of Hitler’s puppet state, the NDH. 250,000 Serbian civilians fled knives against Serbs, just like in 1941. Today, Croatia is once again a state under occupation (NATO, USA) financially and militarily. Croatia is only formally an “independent” state. This statement itself is not so hard to bear for Croats, since on very few occasions during their history have they ever lived in an independent state. And yet, whenever Croatia was independent (formally or not), it was genocidal. Today, we can hear out of “de-Nazified” Croatia that the Jasenovac concentration camp has hosted theater plays by Branislav Nušić (a famous Serbian writer), that any further investigation of Croatian war crimes and genocide is an “insult to the peaceful Croatian people,” as well as the nonsense that the ones who suffered the most under the genocidal NDH were Croats themselves (sic!). Today, we see Croats shamelessly claiming that Dalmatia (part of today’s Croatia along the seaside and an historically purely Serbian ethnic territory) was always Croatian even though it was never part of any “Croatia” throughout history. The real state of affairs proves the distinctly Serbian historical traces of Dalmatia, including the mostly Serbian monasteries built by Serbian medieval rulers such as the Krupa Monastery from 1317 built by Serbian King Milutin or Krka Monastery from 1350 built by Jelena, the sister of Serbian Emperor Dušan. Dubrovnik was a Serbian city even before the 18th and 19th centuries when Croats began to settle there. An example of solid historical proof is that Dubrovnik’s literature was written in Cyrillic. If Serbia would have signed the Treaty of London in 1915, it would possess two-thirds of the Adriatic coast including islands, and would thus have access to the sea. But the notion of the “synergy” and “unity” of “brotherly” nations took priority. The practical political emergence of “Yugoslavism” was the beginning of the national downfall of the Serbs. The myth of brotherhood between the two nations, the Serbian and Croatian, has decomposed many times throughout history. The frustration felt by the Croatian people, constantly oppressed and historically dysfunctional lacking any impulse of self-defense and freedom, has been so enormous precisely because the nation which always opposed them was primarily constitutional (Serbs have historically been the founders of their own states, not the inheritors of others’), Orthodox, and rich in history, uprisings, and the struggle for freedom with a great culture, an authentic language, and a former medieval empire. The Croatian scale of heroism only reaches the level of Ban Jelacic, who only managed to bring a slightly greater degree of autonomy to Croatia from the Habsburg monarchy. During the same period, Serbia liberated itself from the Ottoman Empire through several nationwide uprisings. Even during the Thirty Years War between Catholics and Protestants in Europe in the 17th century, in which Croatians participated on the side of the Habsburgs, this nation is remembered for its genocidal crimes, especially against children. There is a famous saying from that time which was also written on a monument in Europe: “Save me Lord from the plague, famine, and Croats.” We Serbs still say the same today.